Synopsis: Winter's not your ordinary teenager. While trying to rescue his sidhe family from exile, he mistakenly unleashes the monstrous Dread Host upon humankind. Winter's mother wants nothing more than to find a way to break the curse keeping the sidhe imprisoned on Manhattan. New York City is driving Winter's family slowly mad. Winter's sister wears Chanel and longs for a Fairy Court she's never seen. And Winter's mentor is a talking mouse. Winter wants to save the world. When he discovers an unlikely changeling lost in the subway, Winter realizes he's been given a chance to finally banish the Host, and maybe even save his family. But the changeling isn't quite what she seems, and Winter's already unstable world beings to spiral out of control. 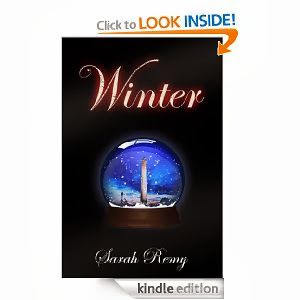 Sarah says: When Jill asked me to pick an excerpt from my YA urban fantasy, WINTER, I had less difficulty than I expected. WINTER is the first volume in my Manhattan Exiles trilogy. So many things happen in this first book - I introduce the overlap of sidhe and human realms, I plant the seeds of upcoming war between worlds, and I throw in a murder/kidnapping. But at its heart I wanted WINTER to be about young people trying to find their place in their own personal space - in their families, and around their peers. Who are they? How will they react to upheaval, how will they approach new challenges, and react to love and loss? “Have you heard of the Lough Gur?” Aine asked around her fingernail. She’d tracked Winter to the library when she’d given up sleep. The flickering of his lamps led her past half-pulled tapestries and through empty rooms. She’d found him sitting on a cushion, made lovely by the shifting lantern light, apparently lost in the pages of a large and dusty tome. He’d grunted, but not looked up, so Aine borrowed one of his lanterns and took it to the map. “Lough Gur,” Aine said pointedly, “is far more than a loch. It’s one of the dark places between, a dangerous place where our folk might cross into mortal lands and back again, and where time is terribly muddled.” She shuddered. Winter closed a finger in his book. He regarded Aine thoughtfully, grey eyes sparking in the lantern light. It was hard to tell in the shadows, but she thought the side of his face looked less inflamed. Even scarred he was beautiful in the flickering light, more beautiful than any of the young fay who regularly swarmed about Gloriana. Aine thought more than a part of his beauty was that he was so very different than the boys she had known at Court. Gloriana’s suitors were skilled at song and wordplay, quick with the sword and insult, eager to dabble in intrigue and insinuation. They were like lazy forest cats, wiling away the long hours until the sun went down and it was time for the hunt.